Once you have a list of duplicate groups, you need to select which tracks in each group you want to remove from iTunes and which ones you want to keep. 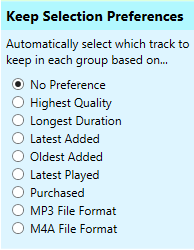 You can now select which tracks in each group to remove by checking the checkbox next to the track. Tracks marked for removal are highlighted red. Note: If you change the Selection Preference while the result of a group search is being displayed, all groups are changed, even those that do not form part of the search. To help with your selection, you can play back music in Tune Sweeper. Simply select the track you want to hear in the duplicates list by clicking on it and then click the "Preview" button. Alternatively, double click on the track in the duplicates list to start the preview. The track will stop playing if you change the track selection in the duplicate list, if you click the "Preview" button again or if the track finishes playing. You may decide that you do not want to delete any tracks from a particular group. In this case you can check the "Ignore this group" checkbox in that group. Groups ignored are greyed out. When this box is checked Tune Sweeper will not remove any tracks from iTunes that belong in that group. A missing track is one that is listed in iTunes but whose associated music file is no longer available on the computer hard drive. Tune Sweeper will always remove these tracks from your iTunes library. You will not be able to select or deselect the remove checkbox for tracks that are missing. Tune Sweeper will never automatically select a missing track to keep either. See 'Missing Tracks' for more details on listing and removing missing tracks with Tune Sweeper. Regardless of search criteria, these will always be marked as the track to be kept over non-cloud tracks. You can manually select to remove these if desired.